GifaPalooza Toolbar is the PUP that uses misleading techniques to prevent removal. Use Reimage to locate malicious components and get rid of them faster than with uninstall instructions. A full system scan blocks virus reappearance and prevents traffic to malicious domains. GifaPalooza Toolbar is a highly suspicious application that falls into spyware and potentially unwanted programs’ lists. Cybersecurity experts say that the majority of the toolbar’s users install it unwillingly and are forced to use a customized version of search.myway.com search engine. 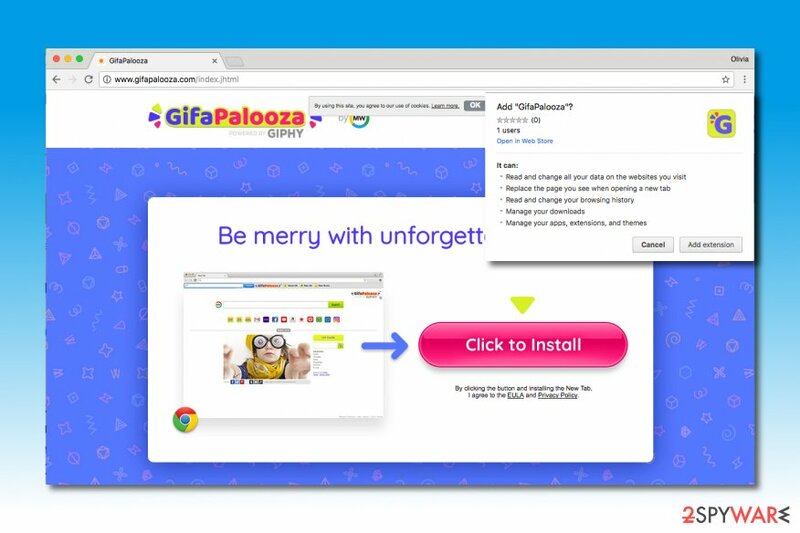 Although GifaPalooza promises to provide unforgettable GIFs for the user to view and share, the real aim of this browser add-on is entirely different. That is why it installs its own search engine into victim’s web browser and changes homepage address. It seeks to convince the user use an untrustworthy search engine that mainly serves sponsored search results and finally redirect one to pages that are highly insecure and doubtful. Of course, we cannot claim that every external website promoted by GifaPalooza Toolbar is insecure and dangerous. However, it is highly likely as the developer of this browser hijacker claims to be not responsible for content shared on these sites. In other words, you might come across highly insecure content while browsing the Internet via the described search site and the developer of it won't take any responsibility for what happens from your interaction with it. Sponsored search results (ads) are also highly annoying as they won’t allow you to see as many organic results as you would like to. Therefore, we advise you to remove GifaPalooza as soon as you can. That can be done using the anti-spyware or anti-malware software. If you haven’t tried such programs yet, we highly suggest using Reimage or Malwarebytes MalwarebytesCombo Cleaner. Of course, you do not have to implement GifaPalooza removal automatically if you do not want to. We only suggest this as an option, because you can also try to uninstall the unwanted program manually. Please use the guidelines provided below the article to find and uninstall the unwanted browser hijacker and its files for good. 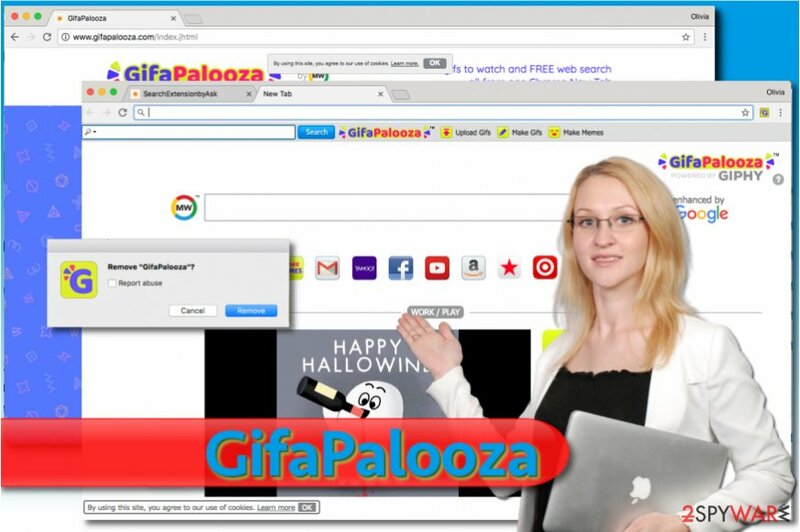 GifaPalooza Toolbar silently installs itself on victim's computer and tries to push sponsored search results for the user. Potentially unwanted programs such as GifaPalooza Toolbar have a tendency to spread alongside free programs in so-called software bundles, says an expert from Senzavirus.it team. It is important to learn how to recognize software bundles so that you could decompose them in time. In general, any free program can appear to be a software bundle, so you have to be careful during its installation. As soon as you open program’s installer, do not rush and read each provided statement with caution. We strongly advise choosing Custom or Advanced installation options whenever these are available. After selecting them, you will see some statements suggesting extra programs to you. Your task is to remove checkmarks from checkboxes next to them. Remove GifaPalooza virus as soon as you can because there is no need to keep such questionable program on your computer and let it push its sponsored content to you daily. No one wants to suffer from such virtual annoyances, so you shouldn’t, too. Although the described program is not a critical computer virus and it only makes it to the spyware category, GifaPalooza removal can improve the functionality of your computer in seconds. Therefore, we highly advise you not to delay its removal and start reading the instructions provided below. Here, look for GifaPalooza Toolbar or any other recently installed suspicious programs. Wait until you see Applications folder and look for GifaPalooza Toolbar or any other suspicious programs on it. Now right click on every of such entries and select Move to Trash. When in the new window, check Delete personal settings and select Reset again to complete GifaPalooza Toolbar removal. Once these steps are finished, GifaPalooza Toolbar should be removed from your Microsoft Edge browser. Fix Firefox by deleting unnecessary extensions such as GifaPalooza. Here, select GifaPalooza Toolbar and other questionable plugins. Click Remove to delete these entries. Now you will see Reset Firefox to its default state message with Reset Firefox button. Click this button for several times and complete GifaPalooza Toolbar removal. Delete GifaPalooza Toolbar using the given guidelines. Here, select GifaPalooza Toolbar and other malicious plugins and select trash icon to delete these entries. Click Reset to confirm this action and complete GifaPalooza Toolbar removal. Here, select Extensions and look for GifaPalooza Toolbar or other suspicious entries. Click on the Uninstall button to get rid each of them. Here, look at the Homepage field. If it was altered by GifaPalooza Toolbar, remove unwanted link and enter the one that you want to use for your searches. Remember to include the "http://" before typing in the address of the page. Now you will see a detailed dialog window filled with reset options. All of those options are usually checked, but you can specify which of them you want to reset. Click the Reset button to complete GifaPalooza Toolbar removal process. ^ Catch spyware before it snags you. Norton Internet Security Center. Tips, Education & Answers. ^ Daniel C. Fain, Jan O. Pedersen. Sponsored Search: A Brief History. Semantic Scholar. An Academic Search Engine for Scientific Articles. ^ SenzaVirus. SenzaVirus. 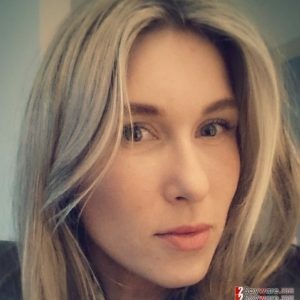 Malware Removal Guides, Security Tips. This entry was posted on 2017-10-31 at 05:14 and is filed under Stealing programs, Viruses. You can quickly scan the QR code with your mobile device and have GifaPalooza Toolbar manual removal instructions right in your pocket. How did you remove GifaPalooza Toolbar?